custom sheet metal, fabricated precision sheet metal, precision sheet metal, precision sheet metal prototypes., precision sheetmetal, prototek, prototek manufacturing, quick turn sheet metal, Registrations And Certifications, sheet metal fabrication, short run sheet metal. Prototek Precision Machining specializes in rapid prototyping of precision machining prototyping, short runs and quick turn around products and apply the most state of the art and comprehensive processes to meet the competitive demands of the industry. Prototek machining also use the latest software packages including – Camworks, Gibbs cam, MasterCam, Pro E, Solidworks, AutoCAD, CadKey to accommodate any engineering situation. Alloys, Aluminium (2024,3003,6061,7075), Steels (Mild to Tool Steel), Stainless (300 SERIES, 400 SERIES, 15-5, 17-4), Brass (All grades), Bronze (All grades), Copper (All grades), Titanium (Most grades), Inconel, most other exotic alloys, plastics, G-10, Lexan, Delrin, Nylon, Phenolic, Peek, Teflon, Acrylic, PVC, Ceramic (MACOR). CNC programming requires technicians to use computers in order to control machine tools for the purpose of repeatedly manufacturing complex parts (usually metal). Using a program written in the complex G-Code notation, technicians ensure that all products adhere to the same precise measurements. CNC Mastercam was one of the first companies to produce the necessary software for this particular industry. Mastercam changed the way we produce and build. In a way, Mastercam helped pave the way for the last 60 years of industrial growth. Prototek Precision Machining utilizes Solidworks, Pro e and AutoCAD to import you designed files. This allows us to program your parts by using a variety of software like Camworks, Gibbs cam, Mastercam and Winmax based on which program is suited best for your machined parts. We then send programs to our vertical maching centers or our turning centers; this process aids us in the rapid prototyping of precision machining production of your machined parts. cnc, custom sheet metal, fabricated precision sheet metal, fabrication sheetmetal, precision sheetmetal, prototek, sheet metal prototypes, sheet metal prototyping, short run sheet metal. Prototek Manufacturing has over 30 years of precision sheet metal experience and pride ourselves in quality as well as customer satisfaction. We are able to assist engineers in their designing process and make it easy and efficient to send and receive files. We quote all jobs within 24 hours, and when needed, can fabricate ‘no finish’ items within 48 hours. If it’s individualized customer service you are looking for, call us today!! CNC milling machines or machining centers are computer controlled vertical mills with the ability to move the spindle vertically along the Z-axis. This extra degree of freedom permits their use in engraving applications, and also allows to create 2.5D surfaces such as relief sculptures. When combined with the use of conical tools or a ball nose cutter, it also significantly improves milling precision without impacting speed, providing a cost-efficient alternative to most flat-surface hand-engraving work. 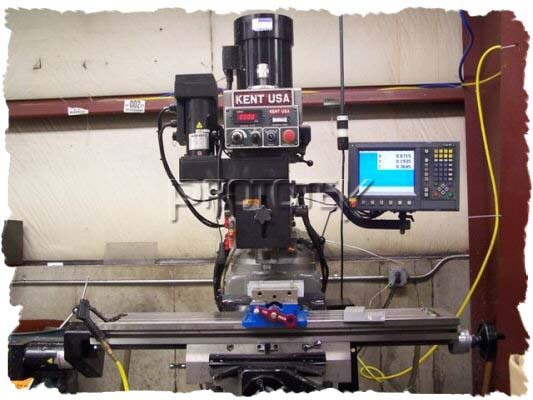 Prototek Precision Machining presently has 3 CNC mills in which we can handle all of your CNC milling needs. We have a Hurco VM2 vertical machining center with a Hurco max control which can be programmed conversational or in g-code. With this machine we can handle your parts up to 40” x 18” x 18”. This machine features a 16 station tool changer, with the machining speeds up to 8000 RPM and it has a powerful 20 hp motor. We also have a Hurco BMC20LR with a ultimax 3 control which can be programmed conversational or in g-code. With this machine we can handle your parts up to 24” x 14” x 14”. This machine features a 16 station tool changer, with the machining speeds up to 6000 RPM and it has a 15 hp motor. We also have a 3 axis Kent knee mill. With this machine we can do larger parts then our machining centers because this machine does not have the guards around the machine. This machine has table travel of 30” in the X, 15.500” in the Y and 15” in the Z. Arm Machining, cnc, custom sheet metal, fabricated precision sheet metal, fabrication sheetmetal, precision sheet metal, precision sheet metal prototypes., precision sheetmetal, prototype sheet metal, quick turn sheet metal, sheet metal, sheet metal fabrication, sheet metal prototypes, sheet metal prototyping, short run sheet metal. cnc, custom sheet metal, fabricated precision sheet metal, fabrication sheetmetal, precision sheet metal, precision sheet metal prototypes., precision sheetmetal, prototek, prototype sheet metal, quick turn sheet metal, sheet metal, sheet metal fabrication, sheet metal prototypes, sheet metal prototyping, short run sheet metal. 4′ WYSONG SHEAR 14 GAUGE CAPACITYShearing is quicking becoming a thing of the past with the advanced technology of our 4000 watt laser that automatically cuts off any unused material after a part is finished being lasered. MST1225 6 Shelf Tower SystemThese 3 machines combine to make a productive cell for processing materials upto 3/4 thick. With this machines exceptionally fast operating speed and accurate cut over an extensive range of material guages and types of alloys it will allow us to process an incredible variety of parts without sacrificing productivity. Prototek Manufacturing is located 244 Burnham Intervale Rd in Contoocook, New Hampshire. With a 40,000+ square foot facility, we have increased both manufacturing and office space, which allowed Prototek Sheetmetal Fabrication to serve the longer production run needs of our customers as well as our established niche of prototyping and short run. From I-93 North to I-89 North take exit 6… turn right onto Maple Street and follow signs for Route 127 for approximately one mile. At stop sign take a left, cross bridge and bear left. Take a left on Burnham Invervale and go approx .4 of a mile to the Prototek Sheetmetal Fabrication Faciltiy on the Right side of the road. cnc, custom sheet metal, fabricated precision sheet metal, fabrication sheetmetal, precision sheet metal, precision sheet metal prototypes., precision sheetmetal, prototek, prototype sheet metal, quick turn sheet metal, sheet metal fabrication, sheet metal prototypes, sheet metal prototyping, short run sheet metal. cnc, custom sheet metal, fabricated precision sheet metal, fabrication sheetmetal, precision sheet metal prototypes., precision sheetmetal, prototek, prototype sheet metal, quick turn sheet metal, sheet metal, sheet metal fabrication, sheet metal prototypes, sheet metal prototyping, short run sheet metal.